1-1/2" wide Embossed Soft Genuine Leather Snaps Belt. Western Style Design With Hand-Brushed Oil Antique Look. 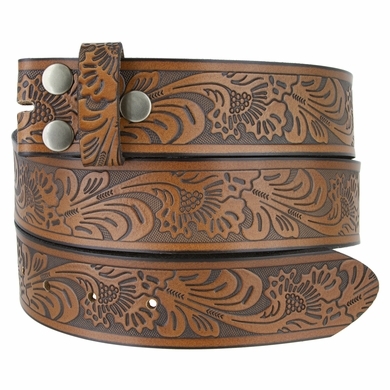 Floral embossed all around the belt. 7 holes for a better fit adjustment. Strap belt to put on and change to your favorite buckle. Comes in gray and brown.